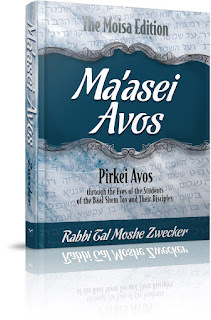 Pirkei Avos is a treasure trove of timeless teachings from our Sages — teachings of mussar, character development, and advice for refining and honing the soul. What better way to appreciate these teachings than through the lens and perspective of our chassidic leaders? 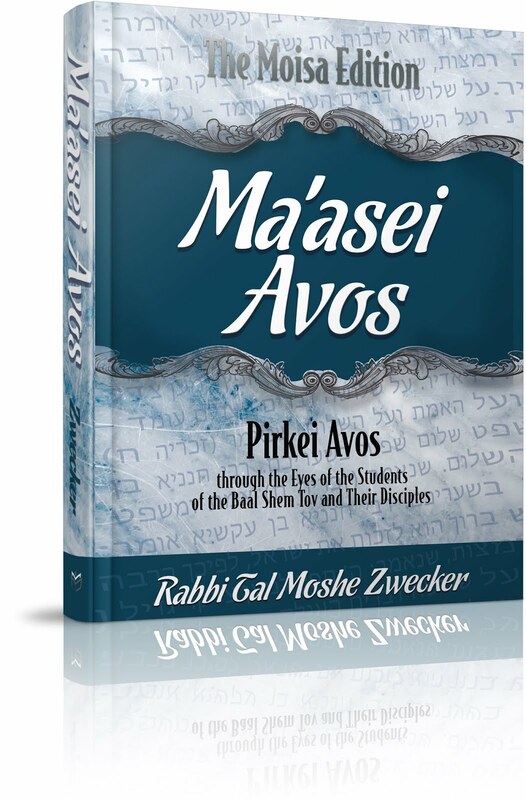 In Maasei Avos, renowned author Rabbi Tal Moshe Zwecker has gathered stories, anecdotes, and parables from the the Berditchever, the Tiferes Shlomo, the Kotzker Rebbe, and many others. Using their words and insights, he illuminates the teachings of our sages in a style that is eminently down to earth...yet inspires us to reach for the heavens. Once again, Rabbi Zwecker has opened the wondrous world of Chassidus to the English-speaking public. Enrich your understanding of Avos with this fundamental and profound work. 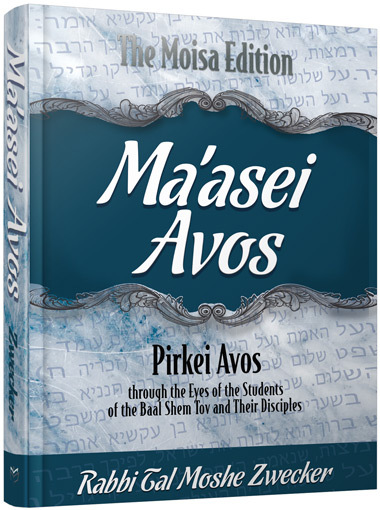 Pirkei Avos is a treasure trove of timeless teachings from our guiding avos — teachings of mussar, character development, and advice for refining and honing the soul. What better way to appreciate the teachings of our avos, our forefathers, than through the lens and perspective of our rebbes, the chassidic masters? The tzaddikim peeled away the layers of peshat (the simple literal meaning) and uncovered the hidden messages of remez (hints), derash (homiletical, analytical, and allegorical), and sod (secrets of Kabbalistic tradition). They revealed deeper meanings and covert messages and unearthed gems of splendorous light from within Chazal's mishnayos. The Baal Shem Tov was the founder of the chassidic movement. The Maggid of Mezritch was his successor, and the Maggid had many disciples who became the next generation of leaders and rebbes. Each of these disciples reflected facets of the primary teachings of the Maggid and the Baal Shem Tov: Love every Jew; teach even the simplest Jew how precious and important his avodah is; be joyful and invigorated when serving Hashem; light your soul on fire when you study Torah; soar Heavenward on the wings of each word of tefillah when you daven; seek the counsel of the righteous and hearken to their advice; observe the wonders and miracles of the rebbes; never forget about Hashem even in the midst of the most mundane acts; and Hashem is there beside you, each step of the way — while you 8 Ma'asei Avos conduct business, eat, sleep, sing, dance, laugh, and mourn. Each tzaddik represents another thread woven together to form a tapestry of chassidus, teachings that shape our avodas Hashem — how we serve G-d, how we relate to man, and how to better ourselves and our lives. Each tzaddik hails from a dynasty and a chassidic court that emphasized these teachings, and as they passed down their rich heritage and molded, guided, and directed their chassidim they told stories: Tales of kings and princes, thieves and bandits, wicked tzaddikim and righteous resha'im, parables and messages. When the rebbes held court and conducted their public meals, the chassidim were invited to their holy tables. At the tisch the rebbe was inspired to say Torah, and the Shechinah spoke through him as he delivered discourses, drawing down Torah from the highest Heavenly spheres to love, rebuke, and shape his listeners. It is from that body of traditional Torah and tales on Avos that I have gathered samples to share with you, my readers. So as the lights dim, shalosh seudos draws near, and the crowd of silk bekishes and shtreimels jostles to get closer and hear a message to heal its heart and balm its soul…come join us! Sit back, close your eyes, and listen to the tzaddik — and don't worry if your Yiddish is a bit rusty and your Hebrew needs some work. I have arranged translation as transportation so that you can join me on a journey to the deepest depths of your own heart and soul, to be moved and transformed by the fire and light of chassidus on Avos. Study the Ohr HaChaim who explains that Moshe did not return an answer back to Hashem from Bnei Yisroel, because Hashem does not need answers, He knows man's heart. Rather the reason why Moshe told over the words of the people back to Hashem was to make them more beloved before Him. He retold of how they said we will do even before, we will hear. Another thing we can say is that when Moshe payed attention to the reply that they had said we will do before we will hear it was a wonder, that no human being could have grasped this concept, only a G-dly power as the Midrash relates (Shabbos 88a; Yalkut Shimoni Shemos 277) [that Hashem asked] "Who revealed this secret which only the ministering angels use to my children." As it says Tehillim (103:20) "Bless Hashem, His angels of strength and might, who do His will and listen . . ." First they act and do His will and afterwards listen. Bnei Yisroel down here below had these things in mind, and Moshe understood that these were not their own words, and that a Divine spirit spoke within them, with His word on their tongues (based on Shmuel II 23:2). The Shechinah itself was speaking from the throats of each and every one of Bnei Yisroel replying We will do and we will here. This is why it says "And Moshe took the words of the people back to Hashem," it means that he took what was said back to Hashem by recognizing the source of these words as being from Hashem. It means that Hashem Himself answered this and He had willed for them to say we will do before we will hear. "And Hashem said to Moshe you should speak, safeguard my Shabbosos because they are a sign between us, to know that I am Hashem your sanctifier." (31:12-13) Our sages (Shabbos 10b; Beitza 16a) derived from here that whoever gives a gift to his friend must tell him so. The Holy One told Bnei Yisroel. "I have a great gift stored away in My treasury and her name is Shabbos." Surely Shabbos is a great gift, the light and sanctity which comes down from above into people's hearts, and the holy spirit of sanctity and a renewed intellect and vitality which comes from the supernal world known as Aravos from which vitality and delights emerge since it houses the stores of life. (Chagiga 12b) Truly a person should wait in anticipation for the gift of Shabbos all week long, waiting for the sanctity and vitality which is coming to him and surely this requires great preparation all six days of the week for Shabbos. And just as he prepares himself so will his grasp of Shabbos be, as the verse tells us (prev. 16:5) "and they prepared that which they brought," teaching us that a person must exert himself during the week and prepare so that he will have Shabbos. "Whoever exerts himself on Friday will eat on Shabbos and whoever does not from where will he eat?" (Avodah Zara 3a) And although a person may prepare himself it is still a great gift, because even if a person will prepare himself in many different ways, he is nonetheless unworthy of the great holiness and abundance bestowed to him by Hashem on the Shabbos day, as much as he prepares it is still a free gift. However he must prepare himself to have a vessel ready to accept it and the strength and energy needed to do so. There are two components to the observance of Shabbos, and they are Zachor – remembering and Shamor – safeguarding. Zachor – remembering is the masculine aspect known as duchrah (the active giver) and Shamor – safeguarding is the feminine aspect known as nukva (the passive receiver) (Zohar I 28b). This means that a person who observes Shabbos in order to give Hashem pleasure and delight, that binds his soul up to the highest supernal place by observing Shabbos and he can serve Hashem with an expanded consciousness and send shefa and blessings above to all the worlds, he is the aspect of Zachor (the masculine active giver). Then there are people who serve for their own benefit. And our sages say (Shabbos 118b) even if a person worships idols like the generation of Enosh if he observes Shaboos he is absolved and forgiven," the reason is that when a person sins he separates himself from the source of life and blemishes his soul (Tikkunei Zohar Tikkun 70) however when the sanctity of Shabbos arrives then the Holy One shines into all the hidden worlds a great luminous light and this illuminates a person's soul and then the soul can return to its source. This is the great gift since by observing Shabbos according to all its laws then he is forgiven for all of his sins. So whoever has this in mind when he is observing Shabbos, this too is a good intention. However there is an incorrect way as well, if a person were to have in mind when he is performing the mitzvos of Hashem in order to be rewarded even if that reward is something spiritual, nonetheless that is an aspect of the nukva (the feminine receiver) who desires to take and receive from Hashem, and the primary way for a person to serve Hashem should be to give and send forth shefa through his actions as it says (Tehillim 68:35) "Give power to G-d," (Zohar II 32b; Eicha Rabbah 1:33) This is why the verse says "Ach - However safeguard my Shabboses," because words like Ach and Rak are used to exclude (Rashi ad loc here on 31:13). This refers to the lower level since they are called miyut in Hebrew which means small. The least level is to at least safeguard my Shabbos on the level of Shamor. Because it is a sign, to know that I Hashem am sanctifying you,"that through the sanctity of Shabbos I remove all forms of affliction from you and enlighten your soul and forgive your sins. And whoever can rise up to the level of the male (the active giver ) is surely good. Or we can say that the verse hints to us another matter, that if all of Bnei Yisroel could observe Shabbos how great that would be! However although many of us, heaven forbid do not fulfill it properly the verse promises us that through the righteous ones in every generation who do observe Shabbos properly they give the Creator great pleasure and delight. A Tzadik is called Shabbos as is known (Zohar II 94b). This is why the verse has the word Ach which means even those who minimally keep and observe Shabbos (Ach is a miyut as was explained above) they safeguard my Shabboses, through the tzadik who is called shabbos, all of bnei yisroel are seen as observing the Shabbos and they will be safeguarded from all harm. And the merit of the righteous tzadikim who properly observe the shabbos shall save the remnant of yisrael (yeshaya 31:5). "For it is a sign between You and me," the tzadik is also called an os or a sign (Zohar I Hashmatos 266a) since he is like a sign or an imprint between Knesses yisroel and the Creator. "To know that I am Hashem who sanctifies you," this signifies that through the Tzadik Hashem's sanctity is renowned, and made known. This is because the tzadik draws knowledge into the world and he tells of the sanctity of G-d to other people. Through the sign of the tzadik all the Jewish people are guarded from all harm and he uplifts them, he uplifts Hashem over them as if they all observed Shabbos properly. "There is no comparison to You, there is nothing except for You, there is nothing without You, for Who is like You?, There is no comparison to You, Hashem Our King in this world; and there will be nothing other than You Our King in the life of the Coming World; there will be nothing without You our Redeemer, in the days of Moshiach and there will be none like you at the Resurrection of the Dead." If a person serves Hashem to be rewarded this is not terrible as the sages derived (Shabbos 63a) "long days on the right," (Mishlei 3:16) to those who do the right thing, "and on the left wealth, honor and glory," so this form of service for reward is the left hand path. However it is not the primary way to serve, the primary form of Divine service is that the servant should not want anything for himself and not ask for anyone but for Hashem and this itself will be his reward the very fact that he is serving Hashem.1 This why we say "there is no comparison to You, Hashem our G-d, in this world," it means that I do not wish to have any delight or pleasure on this world. And if you say, I will serve Hashem so that I shall merit a portion in the next world which is a spiritual form of pleasure and delight, this too is not considered avoda lishma, it lacks sincere intentions. However there in the world of souls some ask for spiritual rewards. But even there in the world of truth, there are tzadikim who do not ask for anything more than G-dly wisdom. As our sages say (Berachos 64a) "Tzadikim have no peace in this world and not in the next world," this is why we say "there is no comparison to You, Hashem our G-d, in this world, and there will be nothing other than You, our King in the life of the Coming World," even there I want nothing more than Your G-dly truth. And if you say, I shall serve Hashem for the days of Moshiach, when Hashem will remove the darkness from our nation and the light and enlightenment will increase and people will achieve high levels and their physical body will become pure and refined – this too is not the primary way to serve. We do not ask for "the Days of Moshiach," either "except for You alone," compared to You everything else is worthless. And not only the days of Moshiach, but even the pleasure which people will receive at the time of the Resurrection of the Dead is also incomparable, in fact no pleasure and delight can compare to the desire for G-dliness. Only to serve You and to be Your servant sincerely for Your sake without any desire for reward or self advantage. 1. The Ohr HaChaim says, " 'Enough' is the opposite of 'extra.' If it is enough, then there is nothing extra, and if there is extra, it is not just enough. There is no room to say that not this and also this were both present, since both refer to the same type and the same aspect, and we have no way to divide one type into two types, since one of these contradicts the other. Also it would not have to say enough at all, rather the verse could have said "And the work had been extra for all the work." And further the entire verse is superfluous since above it says "The people are bringing more than enough for the labor of the work." Obviously they could not have said this until they counted, so then why was it even necessary to add that "the work had been enough etc."? Perhaps this verse demonstrates Hashem's great love for the Jewish people, since they brought a surplus more than was needed therefore Hashem honored them for their hard work and allowed whatever was brought to be used in building the Mishkan. Therefore the verse should be read as "All the work which Hashem commanded to be brought for the labor of the Mishkan was enough to be used for and all the work went into the building of Mishkan even though there was extra. Meaning that even though there was more than necessary, there was nothing left over, even though in reality there was a surplus, as it says there was extra, however there occurred a miracle and there was nothing left over." Rav Meshulam Zisha of Zinkov, grandson of the Apta Rav, related a story he had heard from his father Rav Yitzchak Meir of Zinkov regarding Rav Levi Yitzchak of Berditchev. Once the Berditchever was visiting the Apta Rav in Kolbosov, and he asked to see some of the Apta Rav's writings on the parashah. The Apta Rav happily lent them to Rav Levi Yitzchak. Rav Levi Yitzchak was so immersed in his avodas Hashem that he completely forgot to return the writings to the Apta Rav. After Rav Levi Yitzchak passed on, these writings were found among his own writings, and the publishers thought that these belonged to Rav Levi Yitzchak as well, and they published them mistakenly in his name. Our sages taught in Ta'anis (8b) that blessings do not rest on things that are measured and weighed. However here regarding the labor and work of the Mishkan which was all done according to exacting reckonings and specific measurements, even so blessing rested in it. As it says in Shir HaShirim (7:5) "Your eyes are like the pools of Cheshbon." The root of the evil eye comes from the same source as Bila'am's power, that wherever he gazed there was a blight.1 This is because when that wicked individual would gaze upon something he separated and detached it from its root source up above, from the source of life since he was aflame in desire for that and it was important in his eyes, however he did not see the power of Hashem which was found in that object. However regarding the offspring of the Jewish people it says in Shir HaShirim (7:5) "Your eyes are like the pools of Cheshbon," even something that has measure and is counted (Cheshbon is a place but it also means a reckoning or measurements). Even regarding such things, their gaze is not harmful since each object which a Jew sees, he recognizes the power of the Creator that is in it. Since he attaches that object to its supernal root source, then with this gaze he is able to draw down blessings and shefa from the upper source to this object. This is the meaning of "Your eyes are like the pools," the eyes become as pools and wellsprings of shefa, even to an object that is counted and reckoned - "Cheshbon." This then is the meaning of "These are the reckonings of the Mishkan," in the Mishkan everything was counted and reckoned several times to be exact in the number, nonetheless there was blessing and the Divine presence of the Shechina rested there. All the more so here the counting and reckoning was for a Divine purpose.2 This is why it is written in the verse that it was reckoned "at Moshe's request," since this counting came out of Moshe's mouth who was attached cleaving in dveykus and supernal sanctity, then it even added blessings. Notes: 1. See Zohar I 68b "What is written regarding Bilaam? "The words of a man with an open eye." (Bamidbar 24:15) He had an evil eye and everywhere he would gaze he would draw down a spirit of destruction. This is the manner in which he wished to gaze upon Israel, since he would destroy wherever his eyes would gaze." See also Ramban's commentary to Bamidbar 22:35. 2. See Zohar II 225:1 "Rav Yitzchak asked Rabbi Shimon, since we know that blessings do not rest on an object that has been counted and reckoned, why was everything in the mishkan counted and reckoned? It has been said that in any place where sanctity rests, then if the counting is also done for a holy purpose, then blessings continually rest there and do not depart. From where is this known? From Ma'aser tithes. Since it is counted for a holy purpose, it is blessed, all the more so regarding the mishkan. However any other thing that does not come from the side of holiness, if they are counted or reckoned blessings do not rest there. Since the other side, known as the evil eye can have control over it. And since the evil eye can control it, blessings do not reside there." (Bamidbar Rabba 12:3): At that time when Hashem said, "They shall build for me a Mikdosh and I shall dwell in their midst," Moshe asked, "How can anyone build a Mishkon wherein Your presence can dwell? 'Behold, the heavens and the highest heavens cannot contain You, and surely not this Temple I have built," (Melochim I 8:27); and it says in Yirmiyohu (23:24), 'Do I not fill the heavens and the earth?' and it says Yeshayohu (66:1), 'The heavens are My throne and the earth My footstool; what house could you build for Me and what place could be My resting place?'" "I do not ask," said Hashem, that they do this according to My ability; rather, said Hashem, all I ask for is that each person should do according to his abilities…all I ask for are twenty amos on the south side and twenty on the north side and eight along the west." (Shemos Rabba 5:9) See how the Heavenly voice [at Mount Sinai] went forth to every person, each according to his ability to receive it [individually tailored to his personal level]: the elders according to their ability, the young men according to their ability, the children according to theirs, the infants according to theirs and the women according to theirs. Even Moshe received and heard the voice on his own level, as it says (Shemos 19:19): "Moshe spoke and Hashem answered him with a voice" – with a voice that he was able to accept and handle. Similarly, it says in Tehilim 29:4, Kol Hashem ba'ko'ach – "The voice of Hashem comes in power". It does not say bekocho – according to Hashem's power – it says bako'ach, meaning according to the abilities of each person on his level and according to his capabilities to receive it. Having cited the Medrash and demonstrating how Hashem expects from us only what we can do for Him according to our kochos, the Ropshitzer cites another Medrash, the Tanchuma Teruma, ch. 10, which teaches us that the atzei shittim allude to teshuva [the Medrash says: (They are named) Shittim – because just like Bnei Yisrael angered Me by sinning at the Golden Calf, these Shittim trees should now come and atone for their Shetusim (their acts of foolishness). Another idea is that Shittim is an acronym for sholom, tova, yeshua and mechila (peace, good, salvation and atonement)] because Shittim is a word that derives from the word for nonsense and foolishness – shetus, and Chazal say (Sota 3a) that a person only commits a transgression if a spirit of shetus enters him. The Medrash Tanchuma (Vayakhel ch. 8) also teaches that the atzei shittim atone for the sins of licentiousness that took place at Shittim with the daughters of Moav (see Bamidbar 25:1). So we see from these Medroshim how the atzei shittim atone for sin. Now the Ropshitzer says that Shittim has the gematria of the Soton: shin=300, tes=9, yud=10, mem=40 = 359; shin=300, tes=9, nun=50 = 359. This teaches us that the atzei shittim atone for actions that a person did when under the influence of the Soton who is the same angel as the yetzer hora (Bova Basra 16a). We can now see clearly how the atzei shittim allude to teshuva. Chazal say (Kiddushin 30b) that the Torah is a tavlin (remedy) for the yetzer hora, and the best piece of eitza (advice) to overcome it is through Torah study. This is what our pasuk means, explains the Ropshitzer: "And they shall make an Aron from atzei shittim" – Atzei means an eitza and shittim means shetus – [sins committed while under the influence of a spirit of] foolishness and stupidity. Thus, the wood used from the atzei shittim to build the Aron alludes to an eitza against the yetzer hora, which influences us to act foolishly and transgress. That advice, explains the Ropshitzer, is the Torah, which was placed in the Aron, alluding to the idea that the power to break the hold of the Soton, the yetzer hora, whose gematria is equivalent to shittim, is through the Torah which was placed in the Aron made of atzei shittim. This is why the Aron's measurements were fractions rather than whole numbers, alluding to the power to fracture the power of the yetzer hora through the study of Torah. If a person is broken-hearted over his past misdeeds, this too is a form of teshuva and a way to break the yetzer, because Hashem does not overlook broken hearts. The primary form of teshuva is through Torah study, as Chazal say (Yalkut Mishlei ch. 3:935), "If you usually study one page, then study two." The primary form of Chassidus is also Torah study with diligence and hasmoda. Chazal say (Zohar II 114b), "Who is considered a Chassid? He who acts with chessed toward his Maker." Since Hashem and the Torah are one and the Torah is called a Toras Chessed (Mishlei 31:26) and we say that Hashem's chessed is continuous (Tehillim 52:3), if you wish to act as a Chassid toward Hashem your Maker, you must attach yourself in dveikus to Hashem and His Torah which is chessed – and then you will be a Chassid. This is how the Zera Kodesh explains our pasuk and the Medroshim cited above: "And you shall make an Aron from atzei shittim" – and Hashem does not expect you to do more than your own capabilities and efforts, because the Aron alludes to teshuva. A person might say to himself, "How can I ever rectify my past misdeeds? How can I ever fix my sins and transgressions? There would be no end to the number of fasts and self-flagellations that I need to undergo! Hashem therefore said, "I expect of each of you only what you can do on your level, just as My voice and Presence at Matan Torah went forth individually to each person according to his ability to perceive Me." There is a tradition that the Ohr HaChaim heard a heavenly voice every Shabbos night that blessed him and said to him, "Shloma loch – Peace be upon you!" Rav Shneur Zalman of Liadi, mechaber of the Tanya and founder of Chabad, testified that the Ohr HaChaim studied Torah purely for its own sake – lishma – and that his Torah study formed the twenty-four mystical ornaments for the heavenly bride – (kishutei kalla). Rav Levi Yitzchok of Berditchev writes in his approbation to the Ohr HaChaim's sefer Rishon LeTzion, "Many drank from the living wellsprings – the Be'er Mayim Chaim – of this great luminary, who is a genius among geniuses – gaon sheba'ge'onim, a holy Chassid, renowned world over for his greatness and splendor and the boundless shefa of the light of his Torah and his fear and awe of Heaven, as is seen from his sefer, the Ohr HaChaim." More stories and praises of Rav Chaim ben Attar can be found below in the Yahrzeit section about the Chida, a talmid of the Ohr HaChaim HaKodosh. Daber el Bnei Yisrael – "Speak to Bnei Yisrael, and let them take for Me a teruma, from every man whose heart is charitable shall you take My portion – terumosi" (25:2). The Ohr HaChaim HaKodosh has a unique interpretation of our pasuk: he begins by way of introduction (see Bova Basra 8b) that normally tzedoka collectors must collect in groups of two, because we do not allow individuals to collect money and impose their will on the community as rulers in such matters alone. In fact, he cites the opinion of Tosafos and the Ran (Rabbeinu Nissim) that even two are insufficient except in matters where the amounts collected are fixed, but when estimates need to be made and an appraisal calculated of each person's net worth to fix the amount of the donation, then three collectors must work together to arrive at the correct figure. Now the Ohr HaChaim says that the Halocha is (Sanhedrin 5) that an individual who is an expert can in fact judge these monetary matters alone, and his rule is law. Tosafos there say that he can force anyone to pay a donation and act alone without a need for two. They derive this logically: since an expert can judge matters alone when normally three judges are required, surely here, in matters of rule of law where normally we require just two, he can rule [and calculate and collect tzedoka donations and the teruma]. Based on this concept that an expert can rule, calculate and collect by force, the Ohr HaChaim reinterprets the word daber to mean "rule" and "control" instead of "speak". The Ohr HaChaim understands from the pasuk that Hashem commanded Moshe to rule over Bnei Yisrael as an expert individual, who can rule alone on matters of donation, calculate the net worth and ability of individuals and how much they should give and collect from them even by force if need be. Daber el Bnei Yisrael – "rule over Bnei Yisrael" – and calculate and collect from them on your own, even though appraisal normally requires three and collection two, because you, Moshe, are an expert individual and you can take the place of three and, of course, two, in matters of collection that require rule of law. This idea, says the Ohr HaChaim, is demonstrated in pasuk 36:3, where we see Moshe collecting the donations on his own. "From every man whose heart is charitable shall you take My portion – terumosi" (25:2). The Ohr HaChaim continues his novel interpretation, and suggests that this pasuk implies that regarding people who have nedivus lev (a charitable heart) that encourages him to give, perhaps no appraisal calculations were made. Since we expect that people know how much they can afford to give perhaps since they were self-motivated to be charitable, we just accept whatever they bring. Others have an appraisal. Such a donation, points out the Ohr HaChaim, is called by Hashem "My teruma – terumosi", whereas the first half of the pasuk calls the donations collected [sometimes by force] simply teruma. The Ohr HaChaim points out that this part of our pasuk teaches that we include three categories of people whose donations are normally rejected but are accepted for terumas haMishkon. These three categories include: orphans, women and overly charitable spendthrifts. Normally, we do not take charitable donations from these three types of people because of special rules that apply to each category type: In Bova Basra (8a) we learn that orphans cannot be forced to give charity except when it gives their family name honor and prestige or atones for them. In Bova Kama (119) we learn that women's donations must be minimal except when they are wealthy. Bova Basra (ibid) rules that tzedoka collectors should not visit overly charitable spendthrifts, because Taanis 24a tells us that under pressure they will give too much and under duress they will force themselves to donate beyond their means. When collecting for terumas haMishkon, however, donations were accepted me'es kol ish asher yidvenu libo – "from every man whose heart is charitable" – even from these three categories, [me]'es – to include women, kol – to include orphans, ish asher yidvenu libo – this includes overly charitable spendthrifts. From these three types of people we accept even large sums and gifts for terumas haMishkon. Now the Ohr HaChaim explains why terumas haMishkon is such an outstanding exception to all the normal rules of tzedoka, based on the Medroshim of Chazal: Yerushalmi Shekalim 1:1 and Medrash Tanchuma teach that the Mishkon atones for the chet ho'egel – the sin of the Golden Calf. Furthermore, Chazal explain how it was that Bnei Yisrael had all this wealth to build the Mishkon and donate toward its construction, even though they had recently been released from slavery and were wandering in the desert. In Shemos Rabba ch. 33, Chazal tell us that together with the mon, gems and precious stones rained down. In Medrash Tanchuma on Beshallach we are told that the spoils of the Exodus from Egypt were so great that even the smallest had something like forty laden donkeys of gold, silver and precious stones, and in Medrash Shir HaShirim Rabba, on the words torei zohov, we are told that the spoils of the Egyptians at Kerias Yam Suf were even greater than the spoils of Egypt itself! If so, we see clearly, says the Ohr HaChaim, that Bnei Yisrael were actually very wealthy people. Now we can understand why regarding terumas haMishkon the normal rules of tzedoka did not apply and they accepted donations from orphans, women and the overly charitable spendthrifts. Orphans' donations are only accepted when this lends them a good name; here, the Mishkon atoned for them and for the chet ho'egel. Normally, we accept only small donations from women, but here they were all so wealthy that that rule also did not apply. We do not accept the gifts of overly charitable spendthrifts and we don't send gabbo'im to collect from them because normally we worry about pressuring them; again, they were so wealthy that this rule no longer applied. Finally, the Ohr HaChaim applies what we learned to teach us a lesson that when donating for terumas haMishkon, Bnei Yisrael attached their souls in dveikus to Hashem. This is because the soul is also known as teruma (see Yirmiyohu 2:3, where Bnei Yisrael are called Reishis, and Reishis also means teruma). By giving the donation of teruma they were actually donating their very souls to Hashem, and so His Divine Presence – the Shechina – alighted upon them and dwelled among them. Sponsor the Ohr HaChaim HaKodosh shiur on leil shishi in Eretz Yisrael! As we have been publicizing, many Tzaddikim teach that learning the sefer Ohr HaChaim HaKodosh is a segula for parnossa, Emunas Hashem, Yiras Shomayim, refua sheleima, yeshuos and zera shel kayoma. If you would like to sponsor a shiur in Eretz Yisrael, please contact Rabbi Tal Zwecker at tal.zwecker@gmail.com for further details, and he can help arrange this for you. Rav Zeitchik was Rosh Yeshiva in Buczacz when he was drafted into conscription in the Russian army. Eventually he was taken to Siberia, where half a kilo of bread and water from the distant, icy ravines were his only means of sustenance and nourishment, since all local water was poisoned and unfit to drink. The people, including himself, were unkempt and dressed in rags and tatters, sick, exhausted and in despair. One day, Rav Chaim volunteered to draw the water from the far-off well, a distance of over three kilometers of frozen Siberian wasteland. His reason was that he had discovered somehow that a Jew lived in that area. Secretly, he hid the buckets and made his way, sneaking from tree to tree, from grove to grove, until he reached this Jewish family. He edged closer to the house and indeed discerned a mezuza on the doorpost. When the lady of the house answered his feeble knocking and saw a man dressed in rags, she was fearful of him as an escapee from the Siberian camps, but she was compassionate and offered him a treasure: a slice of bread! She was amazed when he shook his head. No, he didn't want the bread. "I am a Jew. I don't want your bread. Please, do you have a sefer?" She called her husband. "I am so sorry," the husband told Rav Zeitchik. "I am not a Rav – I only own one single sefer and I am not willing to part with it – it is a Gemora." "Please," begged Rav Zeitchik and began to cry. "Please have mercy on me!" he sobbed. "At least give me just one daf! Don't leave me like this!" And so the ba'al habayis tore the Gemora in half. It was an edition of Nedorim and Nozir, and Rav Zeitchik got Maseches Nedorim. There was no one happier in the world at that moment! The Sanzer Rav once made a siyum upon completing the entire Shas. One of the guests who joined him for the siyum was the son of the holy Ma'or VaShemesh, who was known as the "Gutte Yid of Neustadt". This hidden Tzaddik tried to conceal his greatness. He was not known as a great scholar, but was often seen reciting Tehillim, much like the simple townspeople. During the siyum, he told the Sanzer Rav that he too was celebrating a siyum, because he had completed the entire Tehillim. The Sanzer Rav replied, "Would you like to make an exchange? I will give you all the merit I earned from studying the entire Shas, and you will give me the merit of your Tehillim." The Gutte Yid refused the offer, and it stayed at that. Although the Chida was counted among the younger of the Ohr HaChaim's talmidim, still Rav Chaim ben Attar greatly admired him, drew him close and bestowed upon the Chida a special and unique berocha that from Heaven the Chida should be sanctified with the kedusha of Aharon HaKohen! In his old age, the Chida ended up in Leghorn, Italy, which the Jews know as Livorno. He had refused the position of Rav again and again, although the various communities' elders and leaders tried to have him take up the post. Instead, the Chida preferred to sit and learn Torah uninterrupted except for a four-year stint when he took up the post of Rav while he was in Egypt. Nonetheless, although he held no official title or position, all the Jews knew of his greatness and accorded him the honor and respect due to a sage and Talmid Chochom, one of the Gedolim of the generation. One day, a community leader came before the Chida and complained to him that his wife had been seen alone in the company of another man. "If this is so," said the Chida, "you must divorce her, give her a get and she loses any rights to collect her kesuba." The Dayonim heard his decision and were baffled; how could he decide such a matter without any testimony or evidence? But they dared not contradict his ruling. The Chida asked that the wife be summoned to the place in the Bais Medrash where he sat and studied, immersed in Torah. The Chida tried to persuade her gently and kindly to accept a get of divorce from her husband, but the woman was brazen and arrogant. She answered the Rav back with chutzpa and as she spat back her arguments to the Rav, the Chida remembered the berocha he had received from the Ohr HaChaim, his Rebbe, all those years ago. Turning to the insulting woman, the Chida asked, "Please, I have just one request. Listen as I read aloud to you a portion from the Parsha in the Torah." The arrogant woman acquiesced to this one request and stood still as the Chida took out a Torah and began to recite the Parsha of Naso where the Torah describes the sota. As the Chida read the pesukim the woman began to leave in the middle – but she did not escape in time, for just as she reached the stairs, the Chida concluded reading the Parsha of the sota, and no sooner did he finish the last words than she stopped with her foot resting on the step, while her face contorted and her eyes bulged out of their sockets. With a shriek she collapsed and dropped dead. Hearing her outcry, many people rushed to the scene as she breathed her last, and witnessed this miraculous event. Once, the Ohr HaChaim was late to arrive at the Yeshiva. This was uncharacteristic of him and all the talmidim who had gathered at the appointed time for his shiur wondered at this departure from custom. When the hour grew late and the delay continued, the Chida gathered his courage and himself went to his Rebbe's home to see what the delay was about and to call on the Ohr HaChaim. When he got there, he engaged Rav Chaim in conversation and the Ohr HaChaim told the Chida in a totally nonchalant and dismissive manner as part of the conversation, "I was late because I was stuck on a difficult Tosafos which I simply couldn't unravel or understand at all until…Rabbeinu Yitzchok, one of the Ba'alei Tosafos, came and explained to me what he meant." There was once a Chassid from Warsaw whom everyone nicknamed Der Kleine Moisheleh, who made a shidduch for his daughter. Soon after, they discovered that the chosson had a lung disease, and when the kalla found out, she refused to continue with the shidduch. The father of the kalla received permission from a Bais Din to dissolve the shidduch, but when the chosson heard this, he suffered such great distress that the agmas nefesh amplified his disease. His condition worsened from day to day, until finally he died, sick and heartbroken. "Heh! The Halocha is that we rule that he who sues in rabbinical court must follow the sued to his Bais Din in his locale! Now go back home and tell your daughter in my name that if the departed chosson returns, she should tell him that back in Sochatchov they say that if he has any reason to sue her in Bais Din, they need not take the matter up before the Bais Din Shel Ma'ala; rather, they should take the matter up with me right here in Sochatchov and he can take her to a Din Torah here! She should repeat this to him three times." And so it was. She did so and after the third time he never returned, she recovered and never saw him again. Rav Moshe Duvid'l once took the place of the usual shamash, Rav Avrohom Yitzchok, who was called to Warsaw for an important matter, and he tended to the Avnei Nezer's needs. Once, early in the morning, the Avnei Nezer approached Reb Moshe Duvid'l and told him, "Quick – bring me some water to wash, but hurry, now the air is pristine and clean of all sins and crimes and from all worldly desires. It is an opportune time to learn Torah. Take care that no one disturbs me at all. Even if a person should come with a golden crown, do not bring him before me!" And so the Tzaddik sat himself down to learn, aflame with the fire of Torah! Soon a person arrived in modern dress, clean-shaven and wearing a short jacket and asked to see the Rebbe. Moshe Duvid'l laughed at him. "Right now you want to see the Rebbe?" Especially since the Rebbe had expressly forbidden him to bring anyone in. The guest offered Moshe Duvid'l fifteen gold rubles for his trouble, a vast sum. Reb Moshe Duvid'l was struck with awe. He took the gold fifteen-ruble coin, entered the Rebbe's study and told the Tzaddik what had transpired, showing him the coin he stood to earn. The Rebbe wondered aloud, "What?! Do you mean to say that you can earn such a vast sum through me? Bring him in! Just remember – three minutes and no more!" Reb Moshe Duvid'l pocketed the coin and brought the guest before the Rebbe. He waited. After about ten minutes, he could no longer hold back and came in to extricate the man from the Rebbe's room. What he heard was the Rebbe telling him, "Remember to fulfill these three things that I said, and she will have a yeshua!" The man left and that was that. One day Moshe Duvid'l was in Kalisch, when a frum, bearded Jewish stranger in a long coat approached him and asked, "Do you come from Sochatchov?" When he applied in the affirmative, the stranger asked further, "And do you sometimes attend to the Rebbe?" "Yes," answered the bewildered Moshe Duvid'l, whose bewilderment and wonder only grew when the Jew grasped him warmly and said, "If so, you must come to my house to celebrate with us and enjoy a fancy meal." So saying, he steered Moshe Duvid'l off to his home. When the stranger entered, he ordered his wife to quickly prepare a lavish feast. "Prepare a seuda for the man who saved your life – here he is!" And so it happened that our bearded, long-frocked friend was none other than our formerly beardless, short-jacketed stranger, who had once paid Moshe Duvid'l handsomely to get in to see the Rebbe. He explained that his wife had been very sick, almost at death's door, and he had traveled to Sochatchov to seek the Rebbe's blessing and advice. Among the three things that the Tzaddik had told them to do to save his wife's life was to transfer all his children from the modern schools into the traditional cheder. At first, his wife had resisted, but eventually she agreed, and as soon as she did, she got better and better. "And now she is as fit as a fiddle and healthy as can be!" They gifted Moshe Duvid'l handsomely and sent him off to Kalisch in style. See just how much Ahavas Yisrael the Rebbe had, concludes the mechaber of the sefer Abir HaRo'im. In order that Moshe Duvid'l earn a nice tidy sum, the Tzaddik the Rebbe gave up a few precious minutes of his holy morning learning! Once, Rav Gronim of Gur, the ba'al koreh for the Sefas Emes, told of how he visited the Avnei Nezer for Sukkos when he still lived in Kroshnivitz. He was the Rebbe's guest and he slept in the Rebbe's sukka. "The Rebbe himself made the bed and patted down the sheets and blankets to guarantee a comfortable and warm repose. I lay down to sleep and the Rebbe sat down to learn, aflame with excitement and hislahavus! The Rebbe kept checking to see I was asleep and so I made myself as if I was sleeping and just then torrential rain began to fall. It was so strong and buffeted the sukka so hard that the floor was already full of water. I peeked out and saw the Rebbe approach the window in the sukka. He opened the window and called out, saying, "What chutzpa these clouds have, that they dare mevatel me and disturb my learning!!!" No sooner had the Tzaddik uttered this admonishment, than the rain stopped and the clouds discontinued their downpour!" See how precious the Tzaddik's Torah study was in the Heavens! It was Purim, and all over the world the Yidden rejoiced. So much so that even all the greatest lomdim, those Yidden who always sat and studied Torah, were also busy with preparations and joyful Purim business. There was no one studying Torah! No one, that is, except Rav Ze'ev Nachum. Since the world cannot exist if no there is no Torah, Rav Ze'ev Nachum was at the time supporting the entire world! Even in his youth, the Avnei Nezer's power of Torah was already apparent. He once sat learning Torah in the Bais Medrash when a crowd of crying Yidden came in. The crowd began to tearfully recite Tehillim and daven for the refua of a terribly sick Jew whose end was near. Perhaps Heaven would have mercy! Their cries and loud tefillos disturbed the Avnei Nezer's learning. "Listen," he told them, "if you promise to daven quietly and not disturb my study, I in turn promise you that he will recover." The crowd heeded the young Torah scholar and, amazingly, the dying man recovered! The Divrei Chaim of Sanz tested the young genius as a possible suitor for his daughter. Afterward he remarked that "he learns like the Noda BeYehuda, but I cannot take him as a chosson for my daughter – he is too sharp for me!" The Seraf of Kotzk, Rav Menachem Mendel, took him instead for a son-in-law, and as he stood under the chupa, the Kotzker declared, "May it be Your will, Hashem, that his sick, weak body be able to hold such a great, genius mind!" Not long after they were married, the Kotzker's daughter, the Avnei Nezer's wife Sora, burst into her father's home, crying uncontrollably. Amid sobs she explained that her young husband had contracted pneumonia and was coughing up blood. "No need to worry," the Kotzker told her, "he will live a long life. He is named Avrohom and you are Sora – the pasuk says, "Avrohom and Sora were old, coming along in days." Sure enough, this berocha was fulfilled, until age seventy-two, when the Avnei Nezer's Rebbetzin passed on. He then grew weak and sick, and realized that because his father-in-law had blessed him through this pasuk, it had tied him to Sora's long life. Now that hers had ended, his berocha was up as well. When the Imrei Emes of Gur came to console him on his wife's passing, he related the above story, his father-in-law's blessings, and the explanation of how he realized that now his end was near as well.